We've never been parents who buy lots of character-themed toys for our kids. Perhaps a t-shirt here, a stuffed toy there but that was about it. 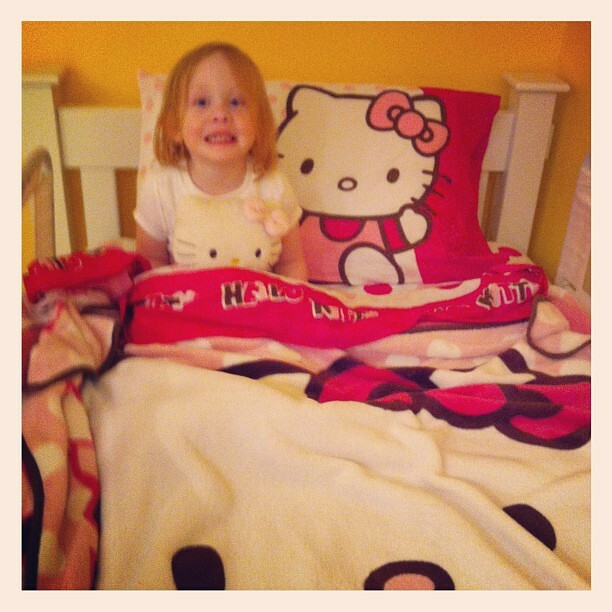 However, Hello Kitty has taken over our house! When you get to kid #3, you already have all the toys in the world. There isn't much to put on the wish list, so when this girl showed off her extreme love for all things cat and Hello Kitty, everyone ran with it (including us). And despite the fact that she truly got all the Hello Kitty in the world for her birthday (with no duplicates), Liv went out yesterday and used her own money (birthday & Christmas savings) to buy these new Hello Kitty sheets (blanket is her travel blanket from Christmas & the doll is from Jack and EJ for her birthday...yes, it's an HK explosion in her bed). She was about to burst with excitement last night at bedtime. I'm pretty sure she talked non-stop to EJ for about two hours post-lights off! This picture makes my heart want to burst! I feel like your numero tres and my numero tres would hit it off and then our heads would self implode formthe quantity of words. Love this!